These scones are amazing and the proof is in the pictures...or lack there of! We ate these up so fast I had to hide a few to let the icing dry so I could take pictures. At first I was a little hesitant of the recipe thinking the rosemary would be too overpowering but I was wrong; it has the perfect blend of savory and sweet. 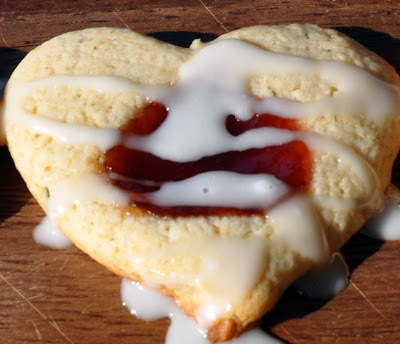 Super easy to make and would be fun for Valentine's Day morning if you use a heart cookie cutter. Place an oven rack in the middle of the oven. Preheat the oven to 375 degrees F. Line a baking sheet parchment paper. In a food processor, pulse together the flour, sugar, baking powder, rosemary, salt, and butter until the mixture resembles a coarse meal. With the machine running, gradually pour in the cream until the mixture forms a dough. On a lightly floured work surface, roll out the dough into a 1/2-inch thick, 10-inch circle. 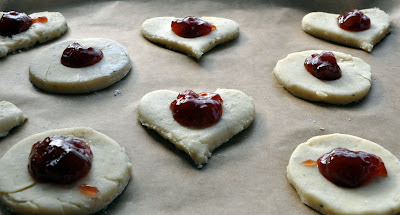 Using a 3-inch cookie cutter (heart shape, circle shape, your choice), cut out the dough and place on the prepared baking sheet. Using a small, round measuring spoon, gently make an indentation in the center of each pastry shape. 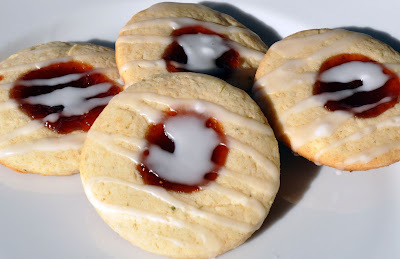 Spoon a heaped 1/2 teaspoon of jam into each indentation. Bake for 18 to 20 minutes or until the edges are golden brown. Transfer the cooked scones onto a wire rack. Cool for 30 minutes. 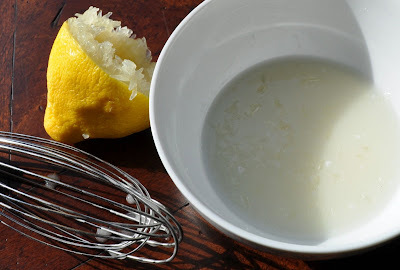 For the glaze: In a medium bowl, mix together the lemon juice and powdered sugar until smooth. If the mixture is too thin add powdered sugar, if the mixture if too thick add more lemon juice or a little water. Using a spoon, drizzle the glaze over the scones while on cooling rack. Let sit for about 30 minutes until the glaze has set. Store airtight in a plastic container for 2 days. Cook’s Note: The dough can also be made by hand by stirring together the flour, sugar, baking powder, rosemary, and salt in a large mixing bowl. Add the butter. 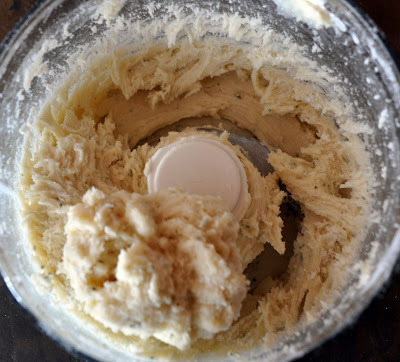 Using fingertips or a pastry blender, work the butter into the flour until the mixture resembles a coarse meal. Gradually stir in the cream until the mixture forms into dough. What I love about scones is that they're really quite fast to make. 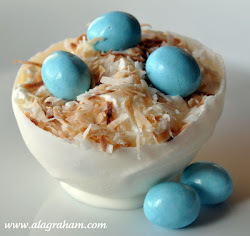 Sweet and savory...yum!